Aesthetics aside, the U.S. rallied from 3-1 down in the third to send the game to overtime, then scored the only two goals of the shootout to defeat Canada in an outdoor classic. Kieffer Bellows and Brady Tkachuk scored in the shootout while all three Canadians missed the target. The first Canadian shooter, Sam Steel, hit the post, but that was as close as they got. Casey Mittlestadt followed up his sensational goal yesterday with three assists today and now leads all scorers with six points in three games. 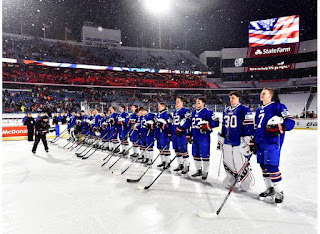 The game was played before a record crowd for a World Junior Championship game, and fans were treated to another North American classic that included a magnificent snowstorm as the backdrop to events at New Era Field in Buffalo. From the opening faceoff flurries danced in the sky as the Buffalo Bills football stadium turned into a winter wonderland of shinny pleasure. Fans streamed in by the hundreds as the first period unfolded, and by the midway point more than 44,000 had filled the large but intimate space. It was anyone’s guess which team had the greater fan support. Thousands of fans waved American flags with mid-winter fervour, but for every flag there seemed to be a red or white Team Canada sweater. No matter. It all made for an electric atmosphere. Power plays proved the most important part of the. Both teams had two each, and all came at timely moments for their team. Canada emerged from the first period with a solid and deserved 2-0 lead thanks to the man advantage. Each team had two chances, but whereas the Americans were ineffectual, Canada struck both times. In the first instance, Cale Makar rifled a shot past Jake Oettinger at 4:13 to stake Canada to an early lead. Then, late in the period, it was captain Dillon Dube, taking a sweet pass from Sam Steel and wiring a high shot past Oettinger before he could blink. As the period came to an end, the intensity of the flurries picked up, and by intermission the snow was too thick on the ice for the Zambonis. The second period saw that wintry intensity continue, wreaking havoc on ice for crisp passes and tic-tac-toe playmaking but giving fans an amazing atmosphere to a game that exemplified why the sport became popular nearly 150 years ago. After killing off an early penalty in the second, Canada played a solid and simple game and dominated much of the play. Tkachuk had one nice chance, but Hart was there with the pad save. That 2-0 lead looked rock solid for a long time. But late in the period Canada incurred two penalties on the same play, and the U.S. struck with the ensuing two-man advantage. 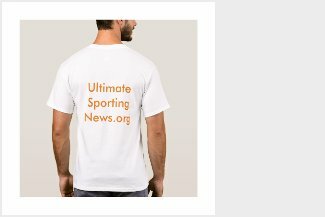 Keeping it simple, Bellows wound up for a shot, picked his spot, an fired a low bullet to the far side past Hart at 16:27, giving the U.S. some life. Canada, however, was not intimidated and responded just 72 seconds later. After a good pressure shift, Jake Bean floated a shot through the snowstorm that was tipped by Boris Katchouk and fooled Oettinger, thus restoring Canada’s two-goal lead through 40 minutes. But early in the third Maxime Comtois took a senseless boarding penalty behind the U.S. icing line, and the Americans capitalized. Scott Perunovich converted a nice feed form Casey Mittelstadt at 6:09 to make it a one-goal game again. That got the Americans going, and even a lengthy timeout to scrape the ice couldn't slow them down. Just 34 seconds later, Mittelstadt fed Tkachuk in close and he snapped a quick shot past Hart to tie the score. The overtime was more cautious than wide open, setting the stage for a shootout just as the snow abated. Using old international rules, the referees has teams change ends halfway through the third period and again in the overtime. Interestingly, five of the six regulation goals were scored at the south end. The win moves the Americans into second place in Group A with five points, two behind Canada.